YZTSE Series 3-Phase Solid Copper Rotor Asynchronous Running Motor with Brake for Crane Applications, and YZDTSE Series 3-Phase Solid Copper Rotor Pole Changing Asynchronous Running Motor with Brake for Crane Applications are newly designed and manufactured by our company. They are a kind of integrated products of combination of the 3-phase asynchronous motor and AC brake. With excellent performance in both electricity and mechanism, they can be used as the driving element of any large and small running gears of various kinds of single and/or double arm and portal crane as well as moving power set of electric running. These series motors have granted an approved patent by the National Patent Bureau. The approval patent number is: 200420114437.X. YZTSE Series Three Phase Solid Copper Rotor Asynchronous Running Motor with Brake for Crane Applications and YZDTSE Series Three Phase Solid Copper Rotor Pole Changing Asynchronous Running Motor with Brake for Crane Applications are better compared with normal 3-phase solid rotor asynchronous motors with brake or 3-phase solid rotor pole changing asynchronous motors with brake in a number of ways. 1.These series solid copper rotor motors has high lock torque, large slip, and gradually starting performance, as it has soft mechanical feature. Therefore, these series motors when used for the crane applications can start smoothly, efficiently and effectively in order to reduce impact and save energy. 2.Because of these series motors equipped with AC flat brake. The brake torque can be adjusted freely. Consequently, the crane applications can move or stop smoothly without any impacts. 3.These series motors are capable for frequently starting and crawling (point movement) due to their small lock rotor current. 4.Taking advantage of the soft mechanical feature of these series motor, these motors are able to replace the wound-rotor motors. As result of that, these motors are more reliable, less accident and reduce cost, as they do not use additional accessories as other motors do, eg. resistors and cam controller etc. 5.In order to increase the reliability and improve service life, YZTSE series motor and YZDTSE series motor adopt the Class F insulation. 6.These motors with an AC brake. The AC brake is powered directly from a three phase power supply without rectified diodes. The AC brakes are not only quick response braking (100 times quicker than a DC single phase brake) but also have improved reliability and long service life. The advantages of AC brakes also include precise positioning, such as no axial movements, and the capability of a wide adjustable range of braking torque, such as from zero (0) to any desired values. The AC brake is an approved patent from the National Patent Bureau. The approval patent number is: 97206492.3. 7.The variation of supply voltage has great influence in the operation of the AC brake. The brake will refuse to work; consequently, the motor will be malfunction, if it is excessive low voltage. However, the brake for YZTSE series motor and YZDTSE series motor is specially signed for the situation of low voltage, such as supply voltage at or above 300V, to ensure the brake and the motor work normally. Compared with YZTSE Series 3-Phase Solid Copper Rotor Asynchronous Running Motor with Brake for Crane Applications, YZDTSE Series 3-Phase Solid Copper Rotor Pole Changing Asynchronous Running Motor with Brake for Crane Applications is empowered with the function of changing number of poles in the participating at the work when it is requested. The motor has been awarded an approved patent from the National Patent Bureau with number of ZL 200820057339.5. Above series motors are available in the direct connection between the motor and the gearbox. Please refer to tables below for details. 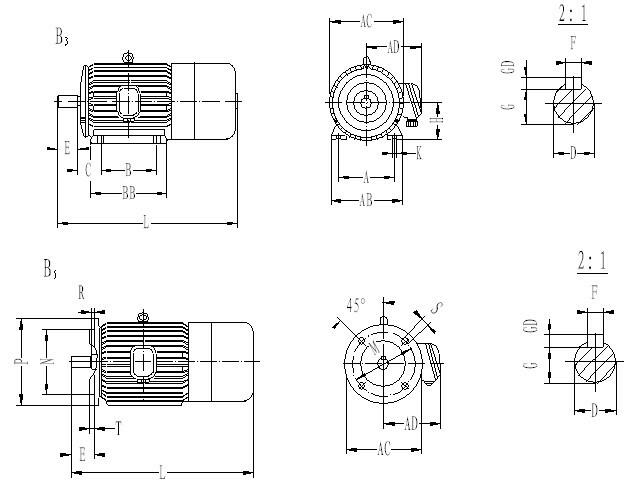 These series motors can be customized designed and produced to meet your request. Note: Above data is the example only. 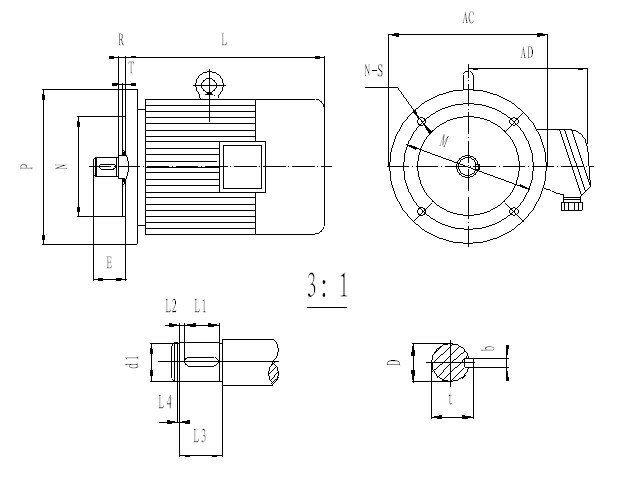 The company is able to design and produce any kind of motors and their components according to customer’s demands.